Food Adventures of a Comfort Cook: PF Chang's Mandarin Style Goes Frozen. PF Chang's Mandarin Style Goes Frozen. The first PF Chang's China Bistro opened in 1992 in Scottsdale, Arizona and now has over 200 locations worldwide. In one episode of "Gene Simmons Family Jewels", his daughter goes on a date to one of the restaurants; which makes me ask, "What makes this restaurant so special, it created meals to sell in the frozen food aisle?" Something tells me it's because it is so popular with celebrities. I've never eaten in one of their locations, but understand that it is Mandarin cuisine which is the Chinese staple for the West coast. If you've read my blog before, and why shouldn't you have, you know I'm from the East coast, so Cantonese is what I enjoy. Also, that one of my very favorite dishes is Chow Fun (Ho Fun). So when I saw a commercial for PF Chang's new Meals for Two containing noodles, and Chow Fun was one of the noodle dishes; I had to try it. Remember, when I go to Chinese restaurants here in the Southwest and ask for Chow Fun, I usually get a strange look from the waiter, or they serve me lo mein. Cooking instructions are pretty simple; put all ingredients into a skillet, turn heat to medium-high, cover, stir occasionally, and within eleven minutes your meal will be done. After eleven minutes though, my little nests of noodles were still in a semi-frozen state and no amount of mixing separated them. So the cover was back on again and I gave it another four minutes; the noodles separated and became coated in the sauce. 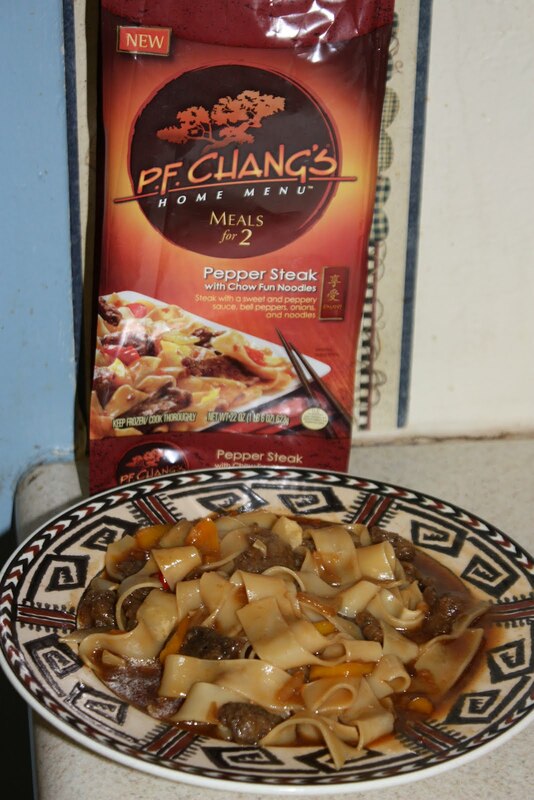 This meal was called "Pepper Steak with Chow Fun Noodles"; the steak pieces were tender and it was loaded with chopped yellow and red bell peppers and onions. The sauce was dark, rich and a surprising medium spice heat which you don't expect in pepper steak. 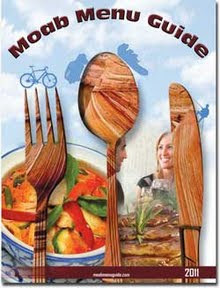 The noodles were a little disappointing; they took longer to cook than the directions called for and they were chewy. However, it was the closest to Chow Fun that I have had out here. 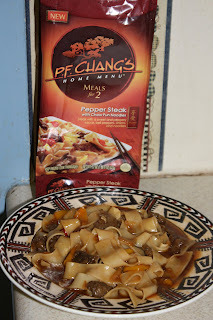 PF Chang's frozen meals run from $6.99 to $9.99 depending on the store you buy it from. Would I buy this meal again? The answer is yes, this is one product I'm willing to give a second chance to. Since I know what to expect when cooking it, I'll adjust the cooking time further to make sure the noodles come out better.